Call Boat Owner Vince 352-275-6583. 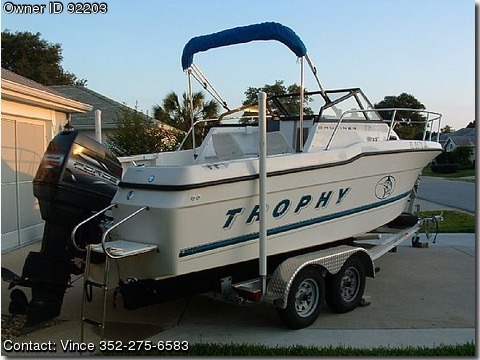 1998 Bayliner Trophy 2002 walk around. 20' with 8' beam. 1998 Mercury Force 120 HP with excellent compression on all cylinders and runs great, had carbs redone in 2010. Has a new Magic Tilt tandem, aluminum, electric brakes, easy on type, will hold a 24' boat. Also replaced in 2010 were all the fuel lines from the 88 gal. tank all the way to the engine with a fuel/water separator. VHF radio, am-fm cd stereo, bilge pumps, aireator for fish tank. Sleeps two. two bimini tops and full cockpit enclosure. I made a custom frame to go with the tarp that covers the entire boat. Swim Platform, Boat and engine in great shape ready to go fishing.